State school funding per-pupil ranked #16 in U.S.
A $2 Billion Tax Increase Inbound: How Would It Impact You? This policy proposal is part of the Sandlian Center for Entrepreneurial Government’s 2019 Legislator’s Budget Guide. Find more proposals here. 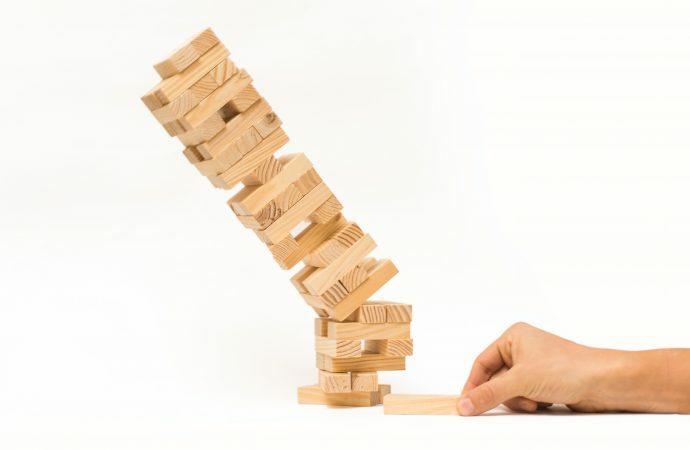 Government economic development policy is like a bad game of Jenga. Policymakers remove a block of taxpayer dollars intended for government services. Eventually they must pay for those tax incentives by raising the tower of tax burdens. The longer the game is played, the easier it is for the entire system to collapse. Economic development in Kansas needs reform. Otherwise, growing tax incentives will make it harder for families to spend their paychecks freely. Governor Jeff Colyer with Governor-Elect Laura Kelly announced “major jobs” in Wichita. Spirit AeroSystems will provide 1,400 extra jobs at an average annual pay of $54,000, financed by taxpayer dollars. Their joint announcement serves as a good reminder that corporate handouts are a bipartisan endeavor. Governor Sebelius proclaimed victory in luring Applebee’s headquarters to Kansas, only for them to leave for California after collecting millions of taxpayer dollars. Governor Brownback offered the American Royal double in tax incentives just to move across state lines. 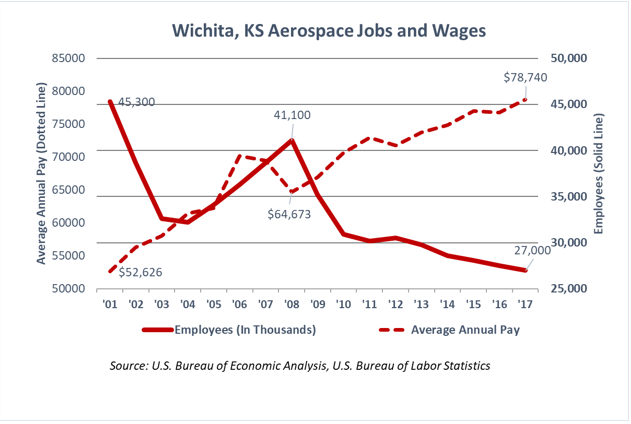 In Wichita’s case, the taxpayer handouts over the years hasn’t reversed the decline in its integral industry; aerospace manufacturing. As seen in the adjacent chart, Wichita is losing on average, 4% of its workforce or roughly 1,600 aerospace workers a year. Why are taxpayers footing the bill for jobs that pay $54,000 a year, when the private sector by itself can pay nearly 50% higher? They shouldn’t. Taxpayers paying for below average wages means businesses can make job and wage investments without taxpayer subsidies. In fact, Spirit AeroSystems is seeing soaring demand for Boeing and Airbus planes, with earnings per share beating expectations. Therefore, taxpayer handouts to corporations is a zero-sum game and a form of cronyism. Only the business with the best government connections benefits, and it’s at the expense of taxpayers. In 2017, that taxpayer expense was roughly $230 million in tax credits , STAR bonds and other incentives, with the state economy in the bottom ninth of growth. Whether it’s individuals or the government, every decision has an opportunity cost; a forgone gain from an alternative use of resources. Put simply, if I spend $1 on coffee I can’t use the same $1 on a candy bar. The $230 million taxpayer block taken from state revenues is partly why it’s difficult to lower the 8th highest sales tax rate, or the record income tax increase. In fact, if government didn’t reward corporations with taxpayer dollars, income tax burdens would be roughly 9% lower, on average. Instead, innovation suffers and fewer Kansas entrepreneurs can compete fairly. Policymakers might have to raise taxes, or cut spending if they choose to give taxpayer dollars to reward specific businesses. This isn’t to say economic development shouldn’t be sought after by governments, far from it. Instead it says the ends do not justify the means. To make a baseball analogy, hitting a bunch of singles is better than always swinging for the fences, and the research shows it. Without startups, the Kansas economy would see little to no job growth. 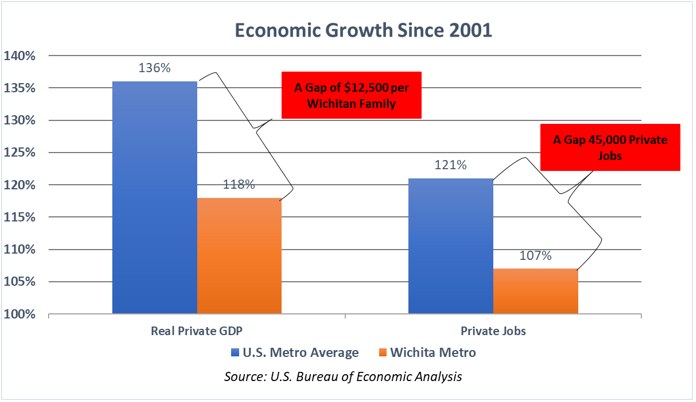 As the chart below shows, if Kansas was able to rein in government spending and inefficiencies instead of giving one firm a tax break, the Wichita Area very well may have 45,000 more private sector jobs, with families making an extra $12,500 by 2017. Policymakers should know how many tax incentives are handed out each year. They should know the dollar amounts involved. Most importantly, they should know whether the economy would’ve grown without them. The state of Oklahoma created the Oklahoma Incentive Commission to find such answers. Plummeting energy and commodity prices caused a massive hole in the state budget and necessitated its creation. It will review 53 business incentives by 2019. That’s 475 million taxpayer dollars up for review. This helps keep tax rates from rising on Oklahoma families, and keeps state government from implementing drastic cuts to spending. We engage citizens and policy makers with research and information to enact public policy solutions that protect the constitutional right to freedom of all Kansans, give them greater access to better educational opportunities, and allow them to keep more of what they earn. By protecting and promoting freedom, we will improve everyone's quality of life, make Kansas more competitive with other states, and attract new citizens and businesses.